“I am less blindly confident than I once was, for I have been learning a truer estimate of myself, my failings and limitations, in these dark days” (193). “…I bow my head before the storm now, I don’t try to fight it any more. I no longer expect things to go well for me; I don’t know that I even ask that they shall. All I ask is that I may fulfill my own small weary part in this War in such a way as to be worthy of Them, who die and suffer pain.” (243). “It all seemed to have mean one thing, and one thing only, ‘a striving, and a striving, and an ending in nothing’” (326). “I did not wish to live emotionally any more, for I was still too tired; I wanted only to stand aside from life and write” (414). Alongside the psychological portrait runs the thread of Brittain’s developing feminism (and pacifism) which change through War’s impact. War overshadows the suffragette movement, illustrated best by the Representation of the People Bill (which gave women over thirty the right to vote) becoming law in February 1918, with little fanfare: “[the Bill] crept to its quiet, unadvertised triumph in the deepest night of wartime depression”. Brittain goes on to be a well-respected journalist and novelist, and a speaker in feminist and pacifist circles. “Could I, a wartime veteran, transform myself into a young wife and mother, and thereby give fate once more the power to destroy my vitality and creative ability as it had destroyed them in the years which followed 1914? If life chose to deal me a new series of blows through G. and his children, should I have the strength to survive them and go on working?” (439). “The fact that, within ten years, I lost one world, and after a time rose again, as it were, from spiritual death to find another, seems to me one of the strongest arguments against suicide that life can provide. There may not be – I believe that there is not – resurrection after death, but nothing could prove more conclusively than my own eventful history the fact that resurrection is possible within our limited span of earthly time” (352). “In no other fashion, it seemed, could I carry out my endeavor to put the life of an ordinary individual into its niche in contemporary history, and thus illustrate the influence of world-wide events and movements upon the personal destinies of men and women” (10). I’d prefer not to criticise this book for want of having as many people read it as possible; but if I had to, I’d note the foreshadowing sentence at the end of each chapter – it became an obvious tool and thus took me momentarily out of the story. 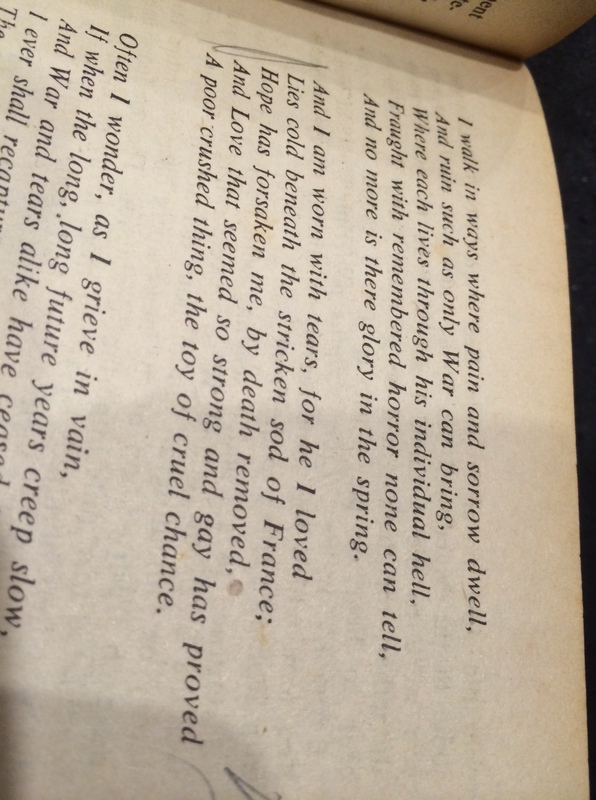 Brittain also left out her thoughts on the prospect of love in the years immediately following the War. It is not until G. turns up that she appears to have even thought about it, which I don’t believe is realistic. Despite these trifling flaws I believe this is an extremely important book for all generations to read. The World Wars seem to us – these lucky generations – something our grandfather’s talked about, or refused to talk about. The War, as Brittain describes, possesses for us “the thin remoteness of a legend, the story-book unreality of an event in long-past history; it would be a bodiless something, taking shape only in words upon the lips of the middle-aged and the old” (439). Let us, as we witness First World War Centenary Celebrations in 2015, remind our children and ourselves, what war really meant. 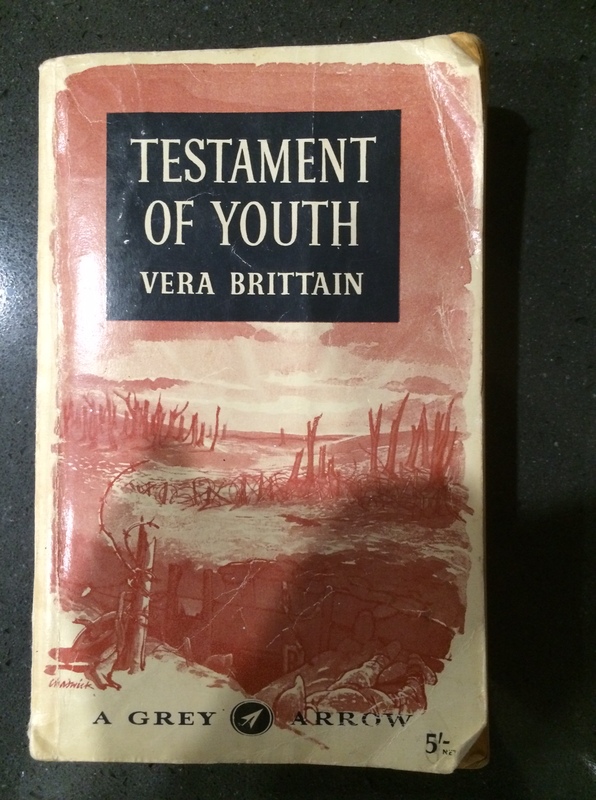 And I wouldn’t truly know if it wasn’t for you, Vera Brittain. Thank you. No I didn’t know Uris had done an NZ stopover. Started reading ‘Testament of Youth’ and hooked. Did you know that Leon Uris was also in NZ? He subsequently wrote Battle Cry. One of the characters in my book is a US Army man in the 43rd Div here in 1944 – it’s a fascinating period to research. Thanks Chuck, I knew you’d have some brilliant recommendations. I’ve ordered The Pacific and Helmet for My Pillow. Obsessed! Wow good on you. Leckie was in NZ briefly. His marine divison was diverted to Wellington before heading to Guadcancal. NZ’s only trained troops were in Egypt fighting so the arrival of the marines helped allay anxieties over a threat of Japanese invasion. There’s a plaque on the Wellington waterfront showing where Leckie disembarked. Great review Caroline- did you get a recommendation to read this? 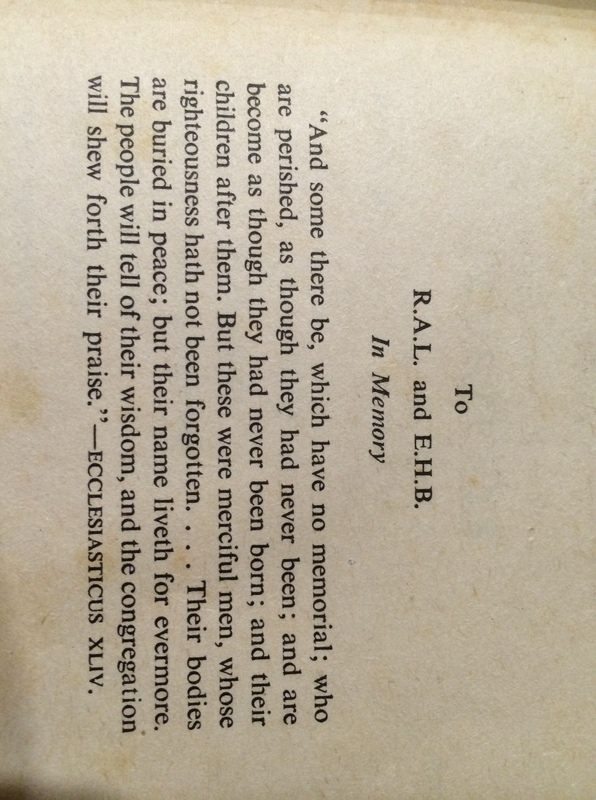 Have you read Robert Graves ‘Goodbye to All That’? It might be an interesting follow-up to this. He fought, survived, and later wrote I Claudius. Hi! I’d come across a number of time, first I think in a Life Writing lecture. It is such an amazing book. Just looked up ‘Goodbye to All That’ and will order. Thanks for the recommendation. Can you recommend any WW2 memoirs along these lines? Howdy- for WW2 memoirs and something quite different I’d look at Rob Leckie’s books about war in the Pacific. ‘Last of the Old Breed’ and ‘Helmet for my pillow’ are well worth a read. Spielberg’s mini-series ‘The Pacific’ is based partially on Leckie’s memoirs. Pat Barker’s Regeneration Trilogy is based on Sassoon’s war experiences.